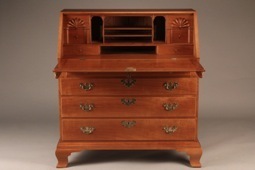 -"Doucette and Wolfe Furniture Makers made nine fireside benches for me. 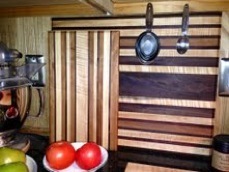 They used a variety of wood species and finishes, which made for individual character for each bench. I gave the benches as gifts to my siblings and kept one for myself! Matt and Mo are dependable and artistic; the project came in on budget and on schedule. I give Matt and Mo my highest recommendation." Can't say enough good things about Doucette and Wolfe! 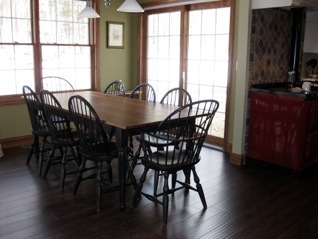 From our first phone conversation to receiving our finished table, they were a delight to work with. 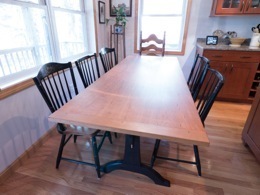 I spoke with Matt initially and we decided together exactly what our table would look like. We loved being able to see the progress of our table on their "works in progress" web page. And we are thrilled with the final product. It looks just beautiful! 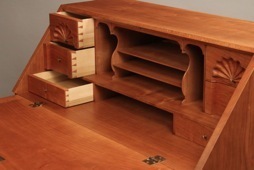 Don't just buy a piece of furniture...buy a work of art from these incredible craftsmen. them up. These pieces will be a part of our family for generations. 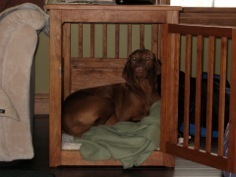 and are currently considering another project for our home. 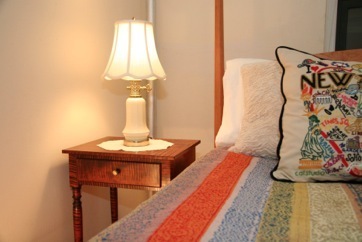 complement our home to perfection! "After the fantastic results of our first commissioned work with Doucette and Wolfe Furniture Makers, we were very excited to undertake another project. 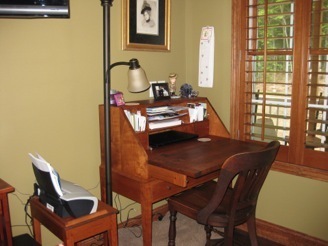 The slant top desk with an interior custom designed to fit my needs turned out exactly as expected, PERFECT! This beautiful piece is a wonderful addition to our home and adds to the warmth of my office space. The custom designed interior is as functional for me as it is beautiful. The quality and finish is fantastic! It feels as though this piece has been part of our home forever and I am happy to know that with it's quality, function and beauty, it will be part of our family for generations. Thank you, again, Matt and Mo for another wonderful piece and another wonderful experience!" and Mo produced even more than we hoped for." I would not hesitate to make future purchases from Doucette and Wolfe or refer your fine company to others. and our experience with Doucette and Wolfe was absolutely, without question, the best. 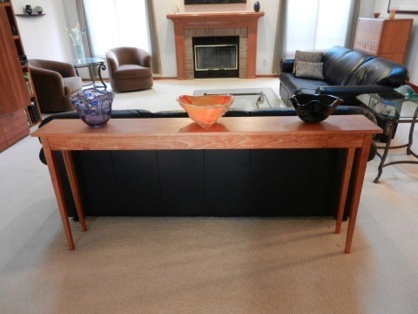 matched set of raw tiger maple transform into beautiful pieces of museum-quality furniture. order more. We cannot thank you enough! 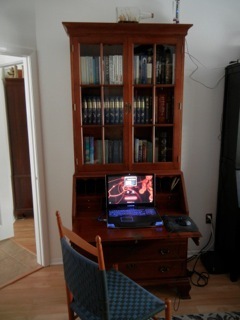 I am sitting at my new secretary desk feeling as if I was in a small town in colonial New England versus sunny Florida. Every part of the experience was great from initial discussions and planning to final design, finish choices, and hardware. Even though I was 1,500 miles away, the updates and pictures maintained a connection throughout the process and I was excited to see each step of the process. The delivery of the piece was done extremely well and I was beginning to use the desk within minutes of the driver arriving at my house. All of my electronic devices fit inside perfectly and with one close of the slant front, it looks as though the piece has gone back in time and could be in a museum. Thank you so much for providing the finest piece of furniture that my wife and I currently own and for your patience and craftsmanship. The piece is truly brilliant and I shall enjoy it for many years to come. I have and will continue to recommend your work to anyone in search of a fine piece of furniture. Doucette and Wolfe is a unique firm. We found them out of desperation. dominate theme of the kitchen. 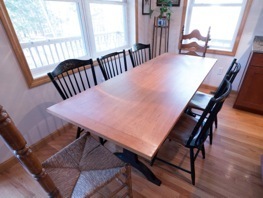 table, if the table were a traditional four corners. reassuring to know that Matt was not going to undertake this alone. shares Matt’s drive for developing unique, high quality furniture. the table far exceeded our expectations. It is exquisite and has already become a family heirloom. And to top it off, we were presented with a free cutting board, made from the scrape of our wood! I commissioned Doucette and Wolfe to produce a replica of the John Townsend block front chest for my wife's Christmas present and the chest they created is spectacular! 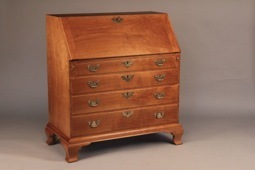 Matt went to the Metropolitan Museum of Art in New York to take the measurements and make shop drawings of an original Townsend chest and they produced a chest that breathtakingly stunning. The attention to detail, the craftsmanship and the quality of materials are museum worthy. We greatly appreciated Matt Wolfe keeping us abreast of the project's progress through Emails and photographs. 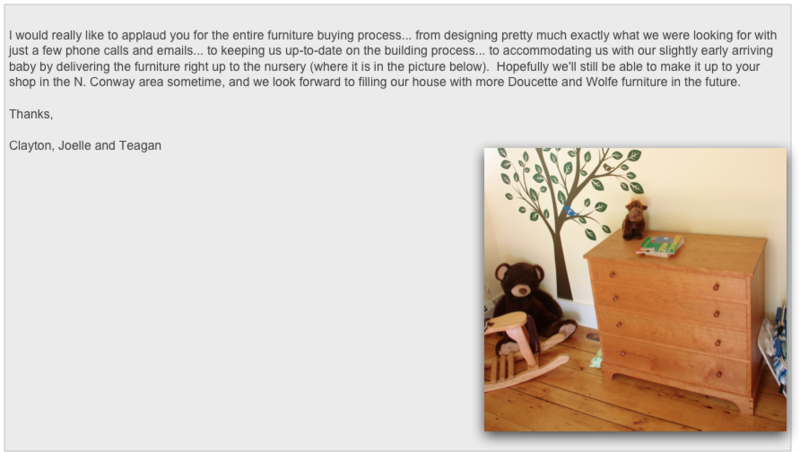 We highly recommend Doucette and Wolfe for any furniture commission; their work is supremely artistic and magical! I grew up in the shadows of the Winterthur Museum in Wilmington, Delaware, and have always had a life-long interest in early American furniture. Indeed, as an adult it has become one of the subjects I lecture on and write about. 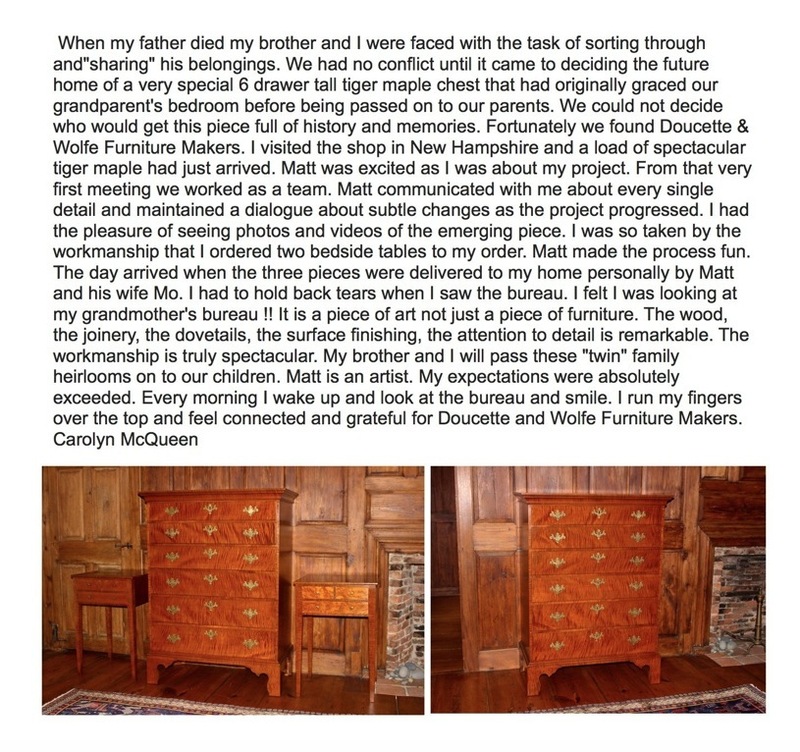 The reason Matt’s furniture looks so right is that it is made the same way as the original antiques. Perhaps he has access to some tools eighteenth-century cabinetmakers would have loved to have, but the structural techniques, proportions, and fine details are all exactly the same. 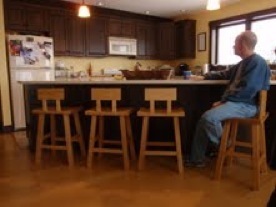 When I was commissioning a piece of furniture from Doucette and Wolfe, I hadn’t anticipated how much fun it would be to follow the building process in the many pictures he sent me; there’s something very exciting about watching what was once just a design take on a concrete form. I recommend this work unreservedly. 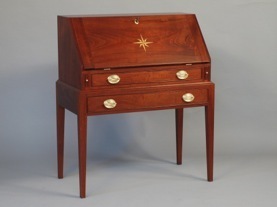 What can I say about Doucette and Wolfe Furniture Makers? Amazing! 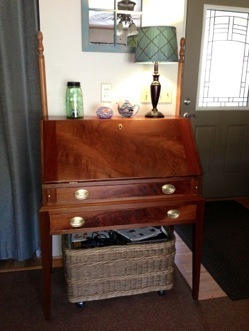 Amazing desk, amazing craftsmanship, amazing customer service. A piece of furniture that will be passed down for generations. We purchased two cutting boards last year and a desk this year. They were awesome to work with. They kept us updated with photos every step of the way as well as telephone contact. They hooked us up with the lumber supplier so we could personally pick out the hardwood for the desk. That made it even more special. 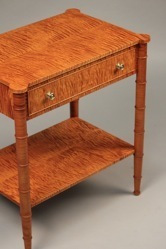 We have started planning our next project with Matt and Moriah, a Townsend Goddard highboy. 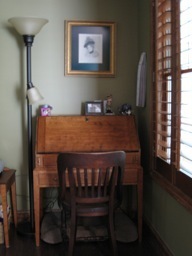 We know that our next project will be as great as this desk has been and my husband and I can't wait. It is a rare event when you order something custom made and it not only meets your expectations, but exceeds them. Matt Wolfe is an artist and perfectionist which is apparent in every aspect of his work. Although he is creative, he doesn't allow his vision to diminish yours, only to improve upon it. 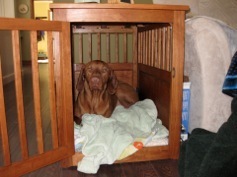 His attention to detail is remarkable and he uses only the finest quality wood available. 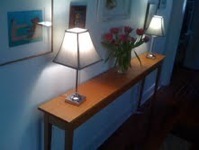 We are thrilled with our new night stands and hope to be working with Matt again soon in creating a desk for our home. We couldn't recommend him more highly. I have received my nine drawer chest, and I am in awe! 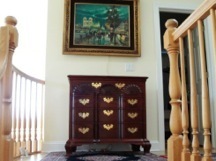 I have never seen such superb artistry and workmanship in a piece of furniture. 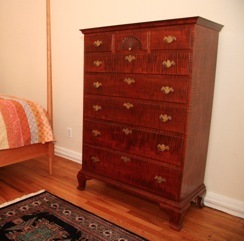 For years, prior to learning about Doucette and Wolfe, I bought my furniture from a well known New England company that specializes in handcrafted "Shaker-type" pieces. I have over a dozen of their pieces, and they are beautiful and well made. 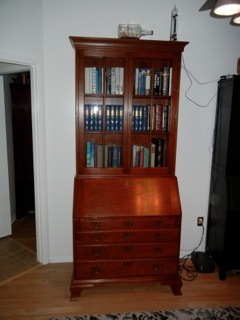 However, this chest is altogether another magnitude of excellence. 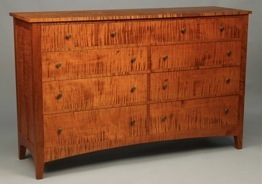 The choice of wood, the matching of the wood, and the attention to detail, including rounding of the back of each drawer, so that there are no sharp corners when it is inside the chest (something no one would even see unless they removed the drawer); the very subtle curve at the front of the top of the chest; even the choice of drawer-pulls; is, in my experience, without parallel. It is a flawless work of art. I have so enjoyed communicating with you. You made a major purchase very easy. All my questions were responded to with fullness and alacrity. In addition, the pricing was very fair, and worth every penny. Thank you so very much for making this chest. It will surely last for hundreds of years, and be a cherished heirloom for my descendants.